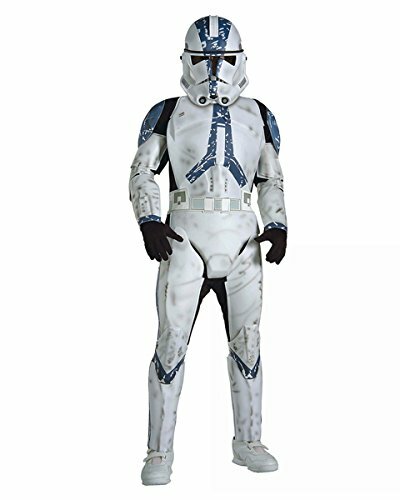 Officially licensed Clone Trooper Commander Cody costume jumpsuit and mask. Weapon not included. Rubie’s offers costumes, accessories, and décor items from Star Wars, The Empire Strikes Back, Return of the Jedi, The Phantom Menace, Attack of the Clones, The Clone War, The Force Awakens, The Last Jedi, Rogue One, and Solo. IMPORTANT: Costumes are sized differently than apparel, use the Rubie’s Child Size Chart, do not choose based on child’s age or clothing size. Family-owned, family-focused, and based in the U.S.A. since 1950, Rubie’s has classic and licensed costumes and accessories in sizes and styles for your entire family. 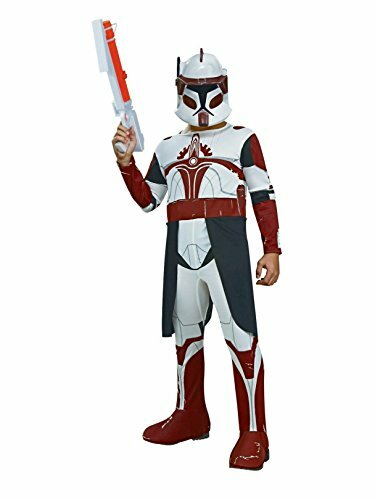 Officially licensed Deluxe Star Wars Clone Trooper costume comes complete with jumpsuit, belt, mask, and molded parts that look like Clone Trooper armor. 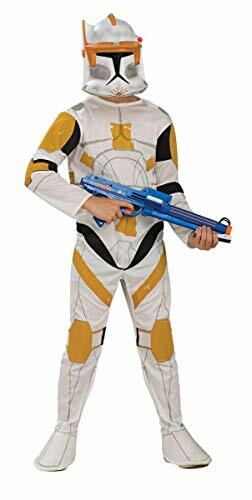 This child Clone Trooper costume has battle-worn detail and will make your little Star Wars fan look and feel like they're wearing the real thing! 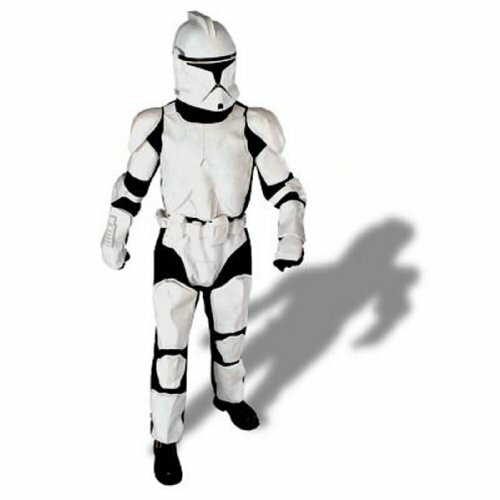 A must-have costume for any Star Wars fan. Rubie’s offers costumes, accessories, and décor items from Star Wars, The Empire Strikes Back, Return of the Jedi, The Phantom Menace, Attack of the Clones, The Clone War, The Force Awakens, The Last Jedi, Rogue One, and Solo. IMPORTANT: Costumes are sized differently than apparel, use the Rubie’s Child Size Chart, do not choose based on child’s age or clothing size. Family-owned, family-focused, and based in the U.S.A. since 1950, Rubie’s has classic and licensed costumes and accessories in sizes and styles for your entire family. Officially licensed Deluxe Pre Vizsla costume, cape, and mask in children's sizes. Rubie’s offers costumes, accessories, and décor items from Star Wars, The Empire Strikes Back, Return of the Jedi, The Phantom Menace, Attack of the Clones, The Clone War, The Force Awakens, The Last Jedi, Rogue One, and Solo. IMPORTANT: Costumes are sized differently than apparel, use the Rubie’s Child Size Chart, do not choose based on child’s age or clothing size. Family-owned, family-focused, and based in the U.S.A. since 1950, Rubie’s has classic and licensed costumes and accessories in sizes and styles for your entire family. Wear this fun Adult Clown Halloween Costume to entertain friends at your next dress-up or Halloween party. This Adult-sized Clown Costume features a colorful jumpsuit in three primary colors with a ruffled neck and two fabric pom-poms that are attached to the front. The sleeves and pant legs of this men's Halloween costume are ruffled at the ends. A matching hat completes the Adult Clown Costume. This Adult Clown Halloween Costume comes in adult standard size only and is intended for people who are under 5'7” tall. The wig, nose, makeup, shoes and cane are not included. Clowns don’t always have to be scary! This adorable Classic Clown - Children’s Costume brings out the silly side of these friendly circus performers. Polka dots and an included stocking cap complete this family friendly ensemble. Don’t forget the circus peanuts! Order children’s costumes and accessories online today. Get your child ready for any costume party with this Spanky Stripes Clown Halloween Costume. It is ideal for getting your little one in character to become an adorable and funny entertainer. This clown Halloween costume set features a brightly colored clown dress with a pom pom front, matching knickers and a hat. The pictured yarn hair is not included. 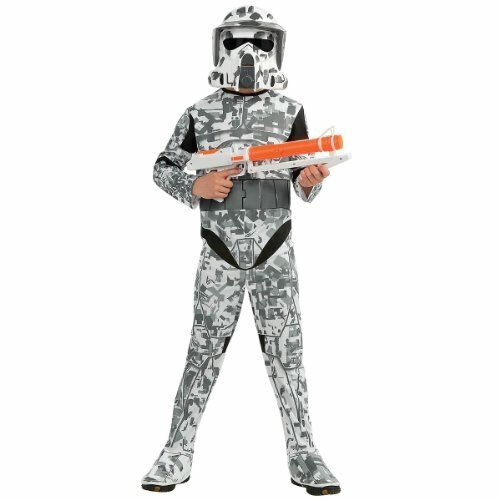 This child Halloween costume is not restricted to Halloween events. It can also be used for school plays, character reenactments, parades, themed family gatherings and other productions and festivals. The material is made of a durable polyester material, so your kid will remain comfortable even with long-term wear. The Spanky Stripes Clown Costume is available in various sizes. Pair it with matching shoes and accessories (sold separately) to complete the entire look.